Have you had the experience of booking a reservation for lunch or dinner through a website or mobile app? When done properly, it’s a quick and easy process that you can do in a minute or less. You simply look for the time you want, enter how many are in your party, enter your name and contact information and you’re done. Now imagine booking an appointment at a veterinary practice just as easily. 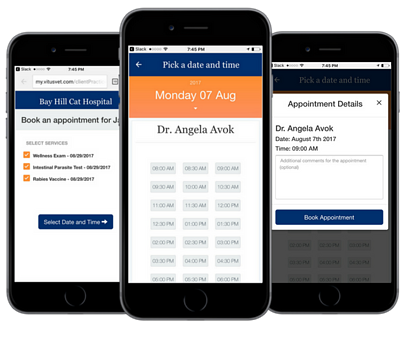 A pet parent pulls out their app (at any time of the day, even when the practice is closed), selects their doctor, selects the date and time that is available and just like that, an appointment is created. That’s it, that’s all they have to do aside from showing up. People want convenience and if your practice isn’t offering it, chances are your clients will be looking somewhere else for veterinary care. Digital transactions are here. The direct booking solution example above is now available, but chances are you’re not using it...yet. That’s why we’ve put together five reasons your practice must adopt direct appointment booking now. Your clients demand convenience. We live in a society where “busy” is the new normal. They’re busy, you’re busy, we’re all busy. If making a veterinary appointment isn’t easy, it won’t get done very often or at all. Your front desk staff will spend less time on the phone. I’m sure you’re familiar with how much time your front desk staff spends making and answering phone calls, so you can imagine how long your clients are waiting on hold. Greatly reduce staff burnout by shifting the majority of your appointments to the a more efficient channel: digital. Your phones will ring less, you staff smile more and your clients will do more business with you. It’s a better process than digital “request an appointment” options some companies are offering. How is scheduling an appointment through direct booking different from what other companies are offering? It’s simple. You’re eliminating the back and forth. Appointment requests tend to have clients enter a time that they’d like to book, and then the practice either responds that it is available or suggestions another time. The process can eliminate phone calls, but the client and front desk staff are still communicating inconveniently. Direct booking eliminates those steps and allows technology to work for you clients and team. An easier appointment process leads to more appointments. Having a great experience of booking an appointment will change the way clients think about going to the vet because they’re associating it with a positive experience. If it’s easy and convenient, it gets done more often. The veterinary field is changing and you don’t want to be left behind. Like restaurants, doctors, air travel and hotels, businesses are going digital. If your practice doesn’t adopt the latest technology, you’ll soon be left behind. By enabling direct booking for appointments, you’re allowing your front desk staff time to focus on more important tasks, you’re staying up-to-date with the latest technology, and offering clients an experience they have come to expect from other types of businesses.